It’s very hard to find one dish that two of my preschool children love at the same time and say a resounding “yes” when I ask if they would like to have it for dinner. In fact I myself love this dish. And I found out this by accident. One day while shopping, I bumped into a Japanese Food Fair. As the name suggested, one would be presented with nothing but Japanese food. From tidbits to tea, from wine to noodles. The best part of the fair was you got the chance to taste before buying… and of course this tactic worked and I ended up 100 dollars poorer. One of the things that I bought was exactly both my kids love. But I only found out after I cooked it. The dish that I am referring to is Japanese curry. No, contrary to what most parents believe, my children say it’s not hot. 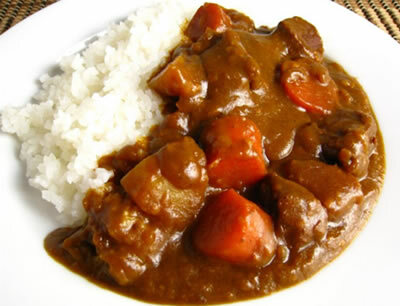 In fact, if you have tried Japanese curry, you will agree with me that it is not spicy. I bought two types of Japanese curry, just to try out. One is Java curry and another is Vermont. Both are by House Foods. I personally prefer Vermont curry than Java. Heat wok with some oil and fry garlic and onion until fragrant. Pour in water and chicken. When mixture boils, add in potatoes and carrot and cook for 20 minutes. Then add in curry paste and cook for another 5 minutes. Best served with rice. Note: When curry is cool it will be slightly thickened. You can use pork or beef instead of chicken. Want more child-friendly healthy recipes? Check out Menu Planning Central.